Location: Shoumen is situated in the northeastern part of Bulgaria 380 km of the capital of Sofia and just 90 km away from Varna sea resort. Shoumen has a rich history and every part of its vicinity seems to tell it. Settlement remains from the bronze epoch were found in the site. History : The town emerges as a fortress settlement on the eastern part of the Shoumen plateau, build by the Thracians during the 5th century BC. Later on the town was again fortified and developed by Romans, Byzantines, Bulgarians and Turks. Together with the ancient Bulgarian capitals Pliska and Preslav during the Medieval period Shoumen was an ancient Bulgarian fortification, that later enlarges as a feudal fortress with inner town many churches and craftsmen workshops. Shoumen falls under ottoman rule in 1388, but in 1444 Vladislav Varnenchik passed through the town with his army and the fortress was demolished by the Turks and the town was removed to its present place at the foot of Ilchev bair (ridge). Two majour hypotheses for the origin of the name exist. Arabic and Turkish historians wrote about a beautiful town bearing the name Shimeonis/ Simeonis – it is considered that it is named after Tzar Simeon the Great. The other hypothesis is that the town bears its name, because of the wild flora that surrounds it. National Revival Period: During the revival period epoch Shoumen forms as a majour craftsmen and trade centre which is a prerequisite for the development of a dynamic cultural life. 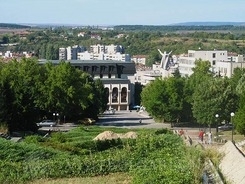 The first public celebration of the day of the saint brothers Cyril and Methodii in Bulgaria took place in the town and the first theatre play was performed here. 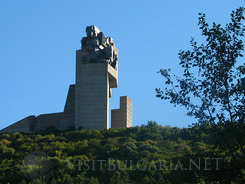 Many revival figures were born in Shoumen and made a lot for the development of the town like the founder of the Bulgarian theatre Vasil Drumev and the revolutionary Panayot Volov. The first cell school for girls, the first symphony orchestra and the first class school for girls were found in the town. After the liberation Shoumen becomes a regional municipality centre. In 1882 the beer factory “Shoumensko pivo” opened doors in the town, build with Czech investments. The site for the construction of the factory was chosen, because of the unique qualities of the water that springs from the carst Shoumen plateau. Sightseeing: The rich cultural- historical inheritance of Shoumen and the region, combined with the beautiful nature give prerequisites for its development as a first class tourism centre. The landmarks of the town are the churches “Sveto Vazvisenie”, “Holy trinity”, the Armenian church “St. Asvizazin” (wholly Mother), Tombul mosque, which is the second largest working Muslim chapel on the Balkan peninsula. The museum houses of the revolutionaries Panayot Volov, Dobri Voinikov, the Hungarian settler Laiosh Koshut, and the great Bulgarian composer Pancho Vladigerov. Historival Landmarks: Among the architectural monuments are the clock tower, the oldest building in Shoumen – the Bezisten, Kurshun cheshma (public fountain) and many others. 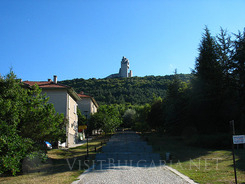 The historical museum preserves findings from different epochs; you can also climb up 1300 steps to reach the emblematic monument “1300 years Bulgaria”. 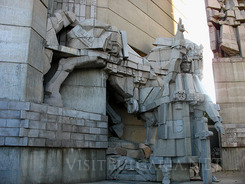 The monument is situated on the top of the Shoumen plateau, which offers incredible view. Art and architectural skills are showing the history of Bulgaria from Asparuh to the Golden century of Tzar Simeon the Great. Another historical- archeological reserve “Shoumen fortress” proudly stands on top of the Shoumen plateau. It is one of the best studied archeological sites in the country. 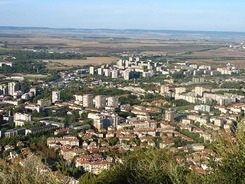 Nearby Shoumen are situated the first and second capital of Bulgaria – Pliska and Preslav. Madara village is also nearby situated. 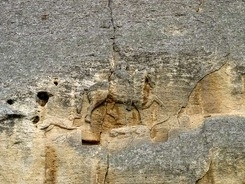 It hosts the unique “Madara horseman” relief listed in the UNESCO heritage list. The Shoumen plateau offers beautiful fauna. Manu holiday homes, placed on the plateau are preferred places for holidays. The plateau is a site, suitable for numerous alternative sports like mountain biking, paraplaner sports, rock climbing and cave exploration. The unique carst relief of the Shoumen plateau has formed 60 caves. One of them is “the Secret hole”, which is among one of the deepest in whole Europe with 115 metres inclination. Night Life: Shoumen has a lot to offer to nightlife lovers. There are several big disco clubs, as well as several small night clubs. The traditional Bulgarian mehanas for gastronomes are also a great number.